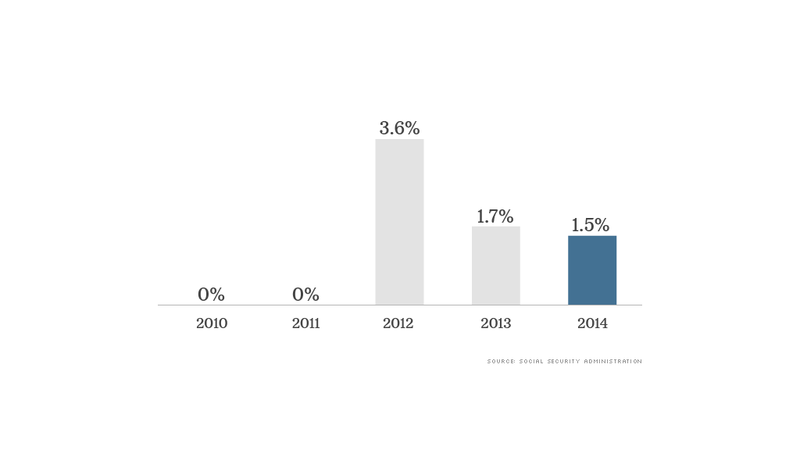 Social Security benefits will rise only 1.5% next year, one of the smallest increases ever in the program's annual cost-of-living adjustment. The increase is down from the 1.7% increase for 2013. There was no cost-of-living increase at all in 2010 and 2011 because prices fell in the wake of the recession. A 3.6% adjustment in 2012 has been the only significant rise in benefits in recent years. The latest adjustment will add about $19 to monthly checks, taking the average benefit to $1,294. The small increase is due to the fact that inflation has been low. Wednesday's reading of the Consumer Price Index, the government's main inflation gauge, showed that overall prices were up 1.2% over the 12 months ending in September. A 7.5% dip in gas prices over that time period was a big factor keeping prices in check. But it's not clear that these adjustments really cover the increasing costs faced by 57 million Social Security recipients, who have different spending habits than the overall population. For example, seniors spend more on health care than the younger population, and government figures show the cost of medical care rising twice as fast as other prices, up 2.4% over the past year. And senior citizens may not benefit as much from some of the prices that have declined. For example, most don't commute to work, so the drop in gas prices over the last year won't be much of a savings to them. A possible change to the way these adjustments are calculated could put an additional squeeze on retiree benefits. Cost of living changes for Social Security and veterans' benefits are currently based on the CPI for workers, one of the government's main inflation readings. But there are proposals from the Obama administration and some members of Congress to switch to using so-called "chained CPI." Related: Can we save Social Security? Chained CPI tracks changes in spending habits that are caused by rising prices. For example, if an increase in the price of red meat causes consumers to shift to chicken, chained CPI adjusts for that change in spending habits. Since consumers cut back on goods and services when their prices rise, chained CPI is always lower than the traditional CPI calculation, which assumes no change in buying habits. A switch to chained CPI would cut future cost of living increases to Social Security recipients. That in turn would likely trim hundreds of billions of dollars off of the nation's deficit in coming decades.